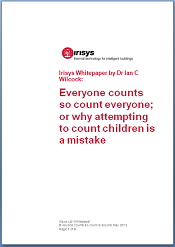 Does counting 'shopper groups' improve retail analytics (whitepaper)? Retailers expect to have the most accurate and reliable people counting data as part of their retail analytics. They need this information to measure footfall, calculate their conversion, and make essential decisions for operational planning, such as queue management. Some retailers are beginning to explore the possibility of being selective in who they include in their conversion calculations. For example, counting groups as a single shopper. However, does adding such subjective factors to people counting make for better information? Should retailers count shopper groups rather than individuals? One method of including a subjective factor to people counting is to examine the concept of ‘shopper groups’. This is where a group of people, who are together, are counted as a single unit by people counting detectors rather than as individuals. Developments in people counting technology mean it is possible for overhead detectors to calculate shopper groups. This is done through thermal sensors, which can identify the proximity of people. For example, if a family walks into a shop, then their physical closeness will allow people counting detectors to identify them as a single shopping group. Is measuring shopping groups viable? In some circumstances, for example families, there are arguments to support the use of this practice. It means that retailers do not have to consider economically inactive individuals as part of their conversion figures. Yet, attempting to distinguish shopper groups can only be a subjective measurement and there are some significant problems with this method. While it is possible to measure shopper groups by their proximity, this cannot always be accurate. Although a group may seem to enter a shop together, it is not necessarily the case that they are a single shopping unit. Also, it is possible more than one person in a shopper group will make a purchase. With the added complications of counting people through subjective factors, it creates inaccuracies in the data. Therefore, it remains that to ensure precise data, retailers need to continue to count everyone entering their shop. Gain further insight into the subject of people counting, retail analytics and subjective factors in our free people counting and retail analytics whitepaper.